Oak Hill’s group homes provide top quality housing for adults living with intellectual and physical disabilities. Homes and apartments are located throughout Connecticut. Each one has been carefully designed to include full- or part-time support staff, supervisors, nurses, speech, occupational and physical therapists and social workers. Each home is unique to the participants that live there. Most have their own bedroom. From two to eight program participants live in a home with the average being six per home (support and independent living apartments are designed for one resident). We offer homes for children and adults and work with each program participant’s planning team to provide a successful transition. Homes for children under 21 are dedicated to supporting children with medically complex needs or behavioral challenges and to providing continuity of learning from school to home. 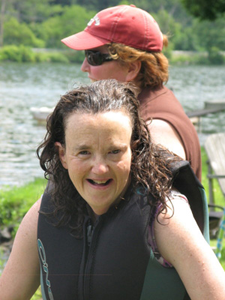 Suzanne moved into one of Oak Hill’s supported living apartments in 2008. Prior to that time, at home, she was reluctant to try new things. Home manager, Heidi Downs, and her staff worked with Suzanne on building her confidence and on developing an exercise and weight loss program. Today, Suzanne is 65 lbs. lighter; she walks daily and swims weekly; rides a tandem bike, and does yoga with her Wii system. She joined a health club on her own initiative and bought a new wardrobe. She also volunteers at the Park Road Playhouse and has created a business knitting scarves and afghans. She is an invaluable help to her fellow participants at work and at home. For people with independent living skills, individualized home supports provide regular, but not live-in assistance. Participants receive the supports necessary to learn, grow and be a part of their community. Apply for a Group or Individualized Home Placement – Individuals must be enrolled in the Connecticut Department of Developmental Services (DDS) Comprehensive Waiver Program to receive residential services.